This week we’re in beautiful Taos. 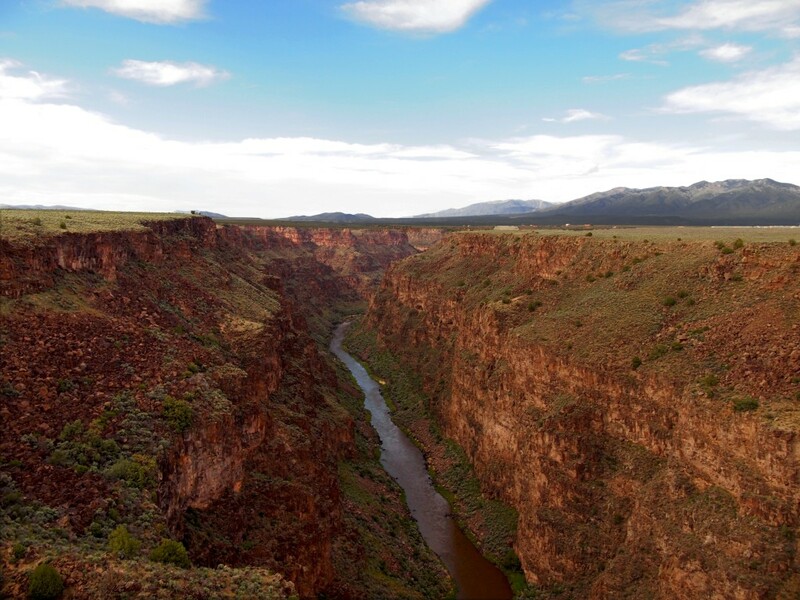 With the impressive Taos mountains on one side, and the equally impressive Rio Grande Gorge on the other, it’s hard not to be taken in by the beauty of this area. 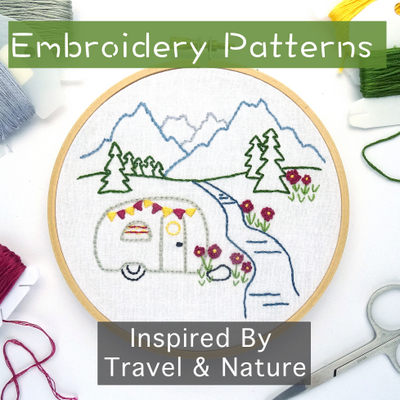 I’m pretty sure that we are now thoroughly enchanted by northern New Mexico, and Taos, with its iconic southwest architecture, funky art scene, and laid back small town charm has only added to this feeling. The other day as we drove down a narrow side street in the middle of town filled with a tangle of brilliant green foliage, and the most beautiful adobe style houses with smooth rounded corners and flat roofs, I declared that someday I would live in a house like this. I think Tim just laughed, but I was serious. As I said before…thouroghly enchanted. Despite the awe dropping beauty of this area, we haven’t gotten out to explore nearly as much as we would have liked this week. A crazy heat wave that has the temps soaring at least 15 degrees above normal, combined with the fact that I’ve been feeling a bit under the weather, means that we’ll be leaving town with our list of things we didn’t do much longer than the list of things we did do. Oh well. There’s always next time. 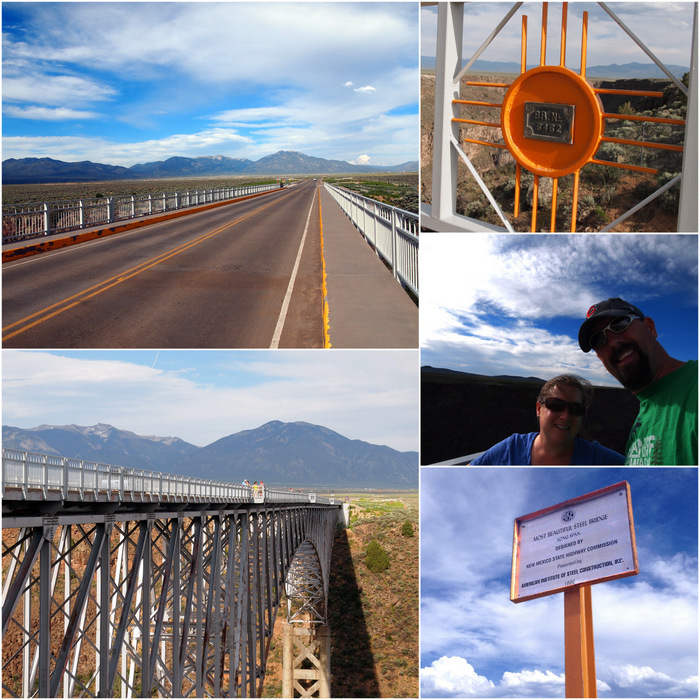 One of the things we did manage was a visit to the Rio Grand Gorge Bridge. 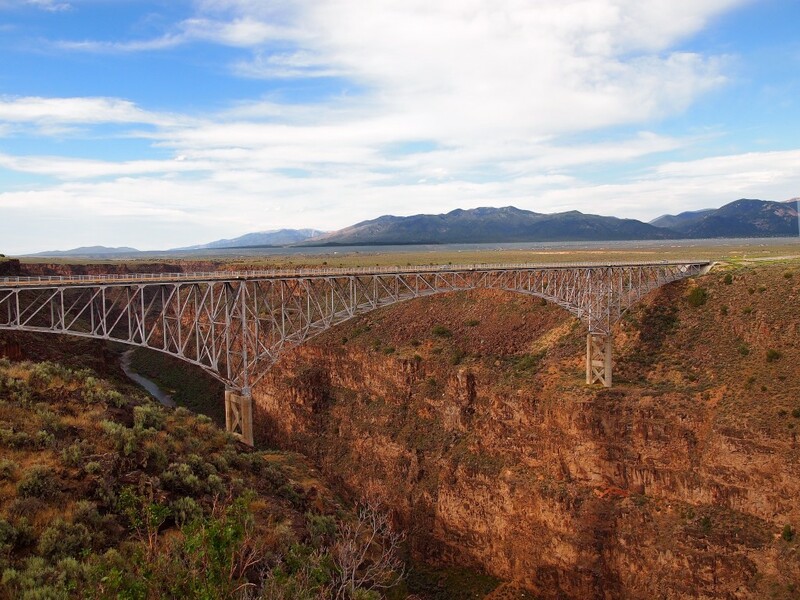 This gigantic steel structure holds the title as the 7th highest bridge in the U.S. (number 1 is the Royal Gorge Bridge over the Arkansas River in Colorado). There’s a little park near the bridge with picnic tables over looking the gorge, and a trail where you can walk or bike along the top of the gorge. We planned to take a long bike ride on the trial, but since I’ve been feeling kind of run down this week, we settled for just a walk over the bridge and back. 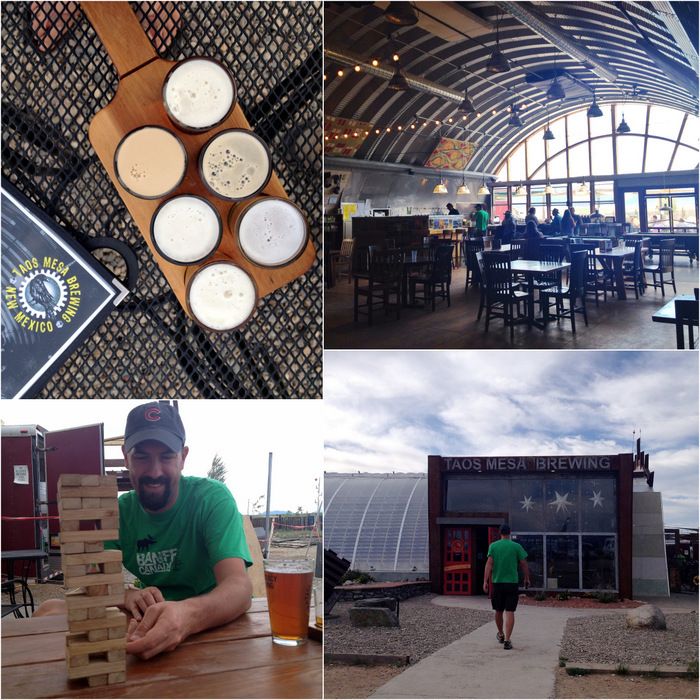 We also made a trip to Taos Mesa Brewing where we enjoyed a flight of beer and dinner on the outside patio. The brewery is on the very outskirts of town, and appeared to be more of a local hangout than a tourist attraction like so many of the restaurants located in town. They had an impressive range of beers on tap, and even though the menu was basic pub food it was fresh and tasty. It was very easy to see why this is such a popular place. We also followed the recommendation of Karen and Greg and ate at Taos Pizza Out Back. 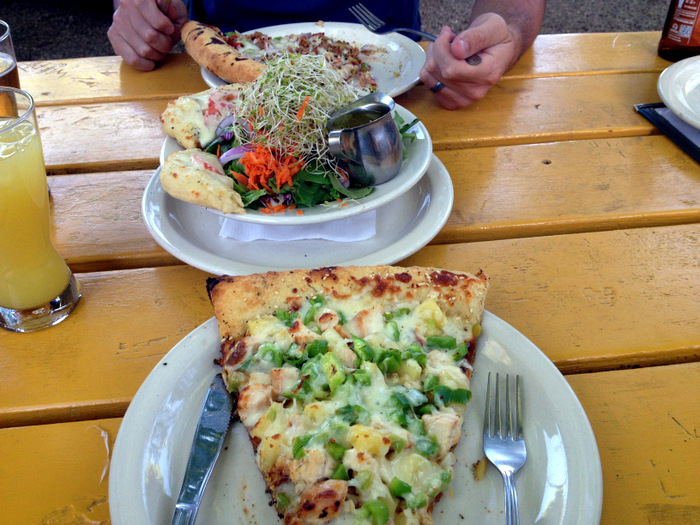 We each got one of their HUGE slices and shared a salad with the famed pesto vinaigrette. Once again we sat outside on the patio enjoying the chill atmosphere and funky decor. 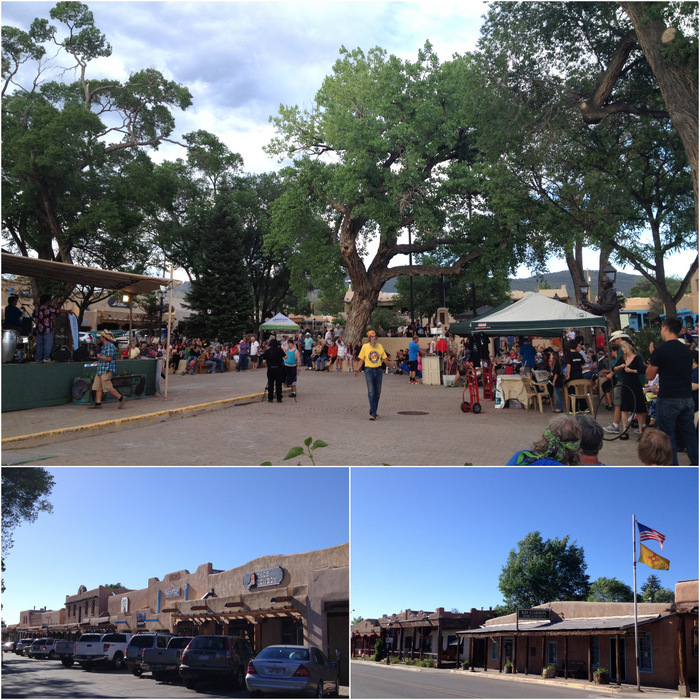 Taos has a Thursday night concert in the plaza series that we went to check out last night. It was very crowded and we didn’t think to bring chairs with us, so we sat on some concrete steps watching the crowd and listening to a Latin band called Nosotros for about an hour. Taos has some excellent people watching! The crowd was a fairly even mix of older tourists taking pictures with their ipads, hispanic families, local hippie hipster types, and some boring looking normal folks. That wraps up our stay in Taos. Today we’re going to make a leisurely drive around the Enchanted Circle and stop in Red River where we hope to find a boondocking spot to spend the week. There’s a Blues and Brews festival happening in town this weekend which sounds like a good time. One more thing about Taos. 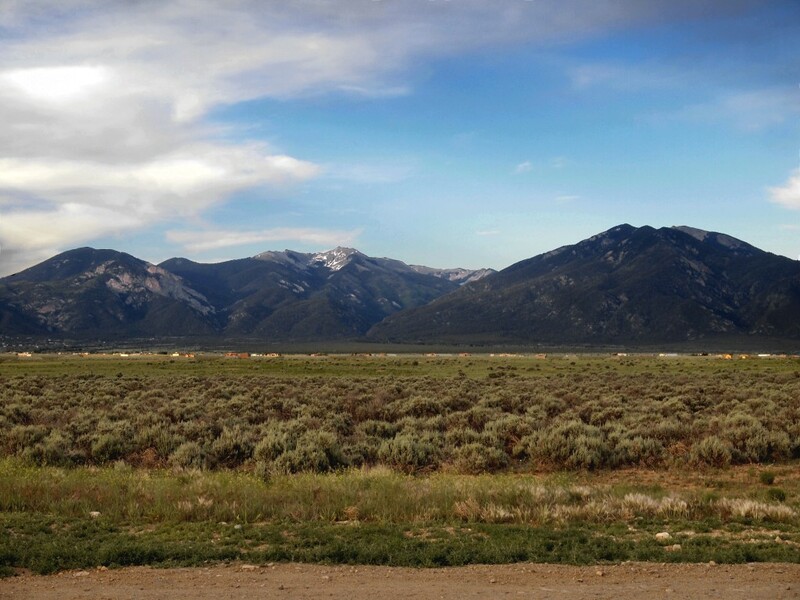 There’s some amazing BLM campgrounds near the Rio Grande Gorge, but with little or no cell service at any of them we ended up staying in town at the Taos Valley RV Park. I was kind of bummed at first because I really wanted to stay near the gorge, but the park ended up being very nice. We went for a back-in, water and electric only site thinking that most other people would stick to the full hook-up, pull-thrus. We were right. 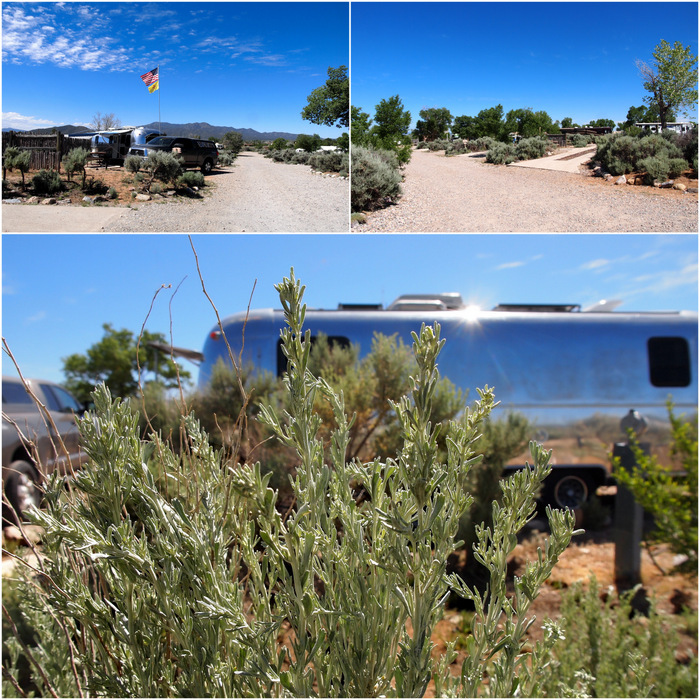 We never had any neighbors all week and the natural sage brush “landscaping” almost had us feeling like we were in a public park. In the end it worked out well because the location was convenient and we were quite happy to have an electric plug in so we could run our AC during those hot afternoons. We’ve always wanted to explore New Mexico and have been so distracted by Utah that we have yet to make it happen. I’ve been loving your NM posts and am determined to get down that way next spring. Thanks so much for sharing! If you are in the Silverthorne/Dillon/Frisco area again this summer, let us know. We’d love to get together again and buy you a drink! Glad you’re enjoying our posts on NM. It really is a pretty amazing place. We’ll be staying at the Peak One campground again this year. I think the 2nd week of August. We should definitely plan to get together when we’re in town. We can totally understand why you like it here so much! We’re still many, many years away from settling down, but when the time comes this area is now at the top of the list. We escaped the heat by moving farther up into the mountains. We’re in Red River where the temps are only in the mid 70s! Perfect. You got great color on the Rio Grande gorge. My photos turned out pretty grey. Did you see any mountain goats down below? They like to hang out below the bridge. We visited the gorge at the end of the day when it had an evening glow on it. That’s probably why the color was so red. I wish we had seen mountain goats! We drove over to the Pueblo but it was already closed for the day :( Missed out on the Earthship community this time, but we’ll definitely be back! 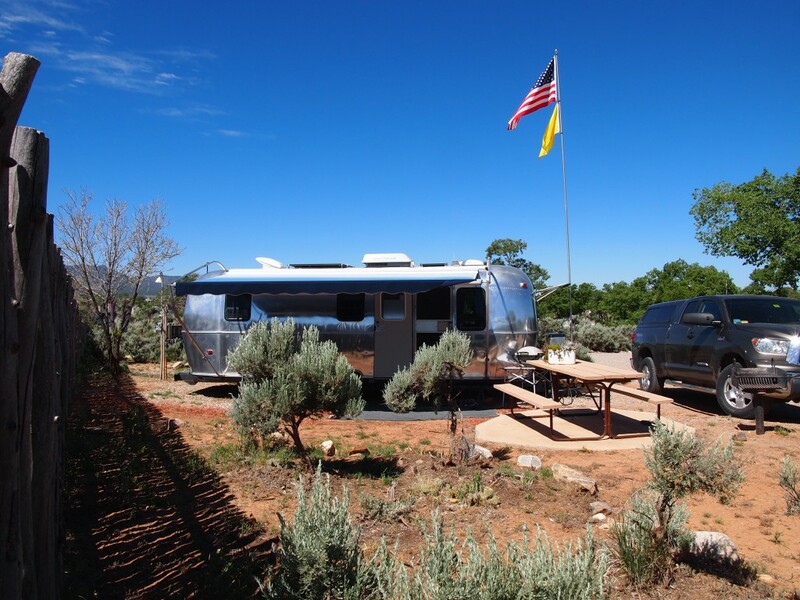 We stay at the Taos Valley RV Park, too — it’s so convenient, and a really sweet park. We need to check out the brew pub next time we’re in Taos. The Blues and Brews Festival in Red River sounds like something we would love — we were just in Silver City a couple of weeks ago for the Blues Festival. So much fun! We were pleasantly surprised by how much we liked the RV park. I wouldn’t hesitate to stay there again. The brewery is definitely worth a visit. Cool atmosphere, friendly staff, amazing views, and good beer! I would highly recommend a visit to Taos. We were very impressed with the town and surrounding area. Hope you are feeling better quickly. Looks like you still got to see many of the highlights of Taos. Enjoy Red River – another beautiful location. I’m feeling much better, thanks! We’ll be back to Taos for sure, and you’re right, Red River is really beautiful! I hope you are feeling better and have the chance to visit the DAV Memorial up near Angel Fire on the Enchanted Loop–it is incredible. As I recall it was much cooler up there. I have many pictures of the gorge. It is beautiful. The altitude could be bothering you, too, depending upon how much altitude you gained. I read through the comments–glad you are feeling better. We passed by the DAV memorial on Friday as we made out way to Red River. Didn’t stop, but it looked very intriguing. I’m feeling better now. I don’t think it was the altitude because I had some adverse effects from it last year in Colorado, and this was nothing like that. Also we’ve been at roughly the same altitude for a few weeks now. Taos is one of our favorite places, we’ve even gone house hunting there for a pueblo-style house. We’ll have to try Taos Outback Pizza next time we’re there. New Mexico in general is high on our list too. We spent some time perusing the local real estate listings. If you’re willing to go with a fixer-upper you can find some really cute pueblo style house at very affordable prices. A visit to Out Back Pizza is a must next time you’re in town!